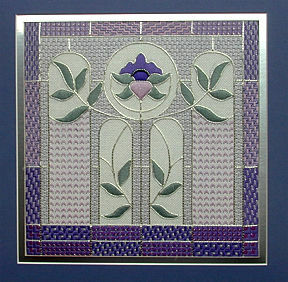 Based on a stained glass design, this floral piece has become a tribute to my husband’s family. The original stained glass piece came from the Kerndt Victorian house built in Lansing Iowa, in the late 1800’s. The panels were actually the upper doors from matching corner cabinets in the dining room. When the house was renovated in the 1980’s, the new owners gave the doors to my husband’s aunt and have since been passed on to my husband and me. Both doors have been cleaned and restored; hardware removed and are used today as window hangings. One is in my studio in Florida, the other remains with our daughter in Virginia. When selecting a design for my final piece for Level II certification from NAN, I remember looking out the family room window searching for inspiration. And there is was – hanging FROM the window. Although the colors are dramatically different, the overall feeling of the piece was maintained. My father-in-law’s was touched when he realized my piece had been inspired from something he had remembered from his grandparent’s house years earlier. He helped me name the piece; Flora (after his favorite aunt) and Cristale for not only the thread that was used, but also for the word glass. Cleve passed away shortly after I completed the second in the series of stained glass pieces, Iris Cristale. I thank him for the encouragement to continue the theme. Flora Cristale is stitched on white Congress cloth in shades of violet and soft green with accents of silver. Threads include Soie Cristale from the Caron Collection, Kreinik silver braid and various weights of Japanese silver. Beads are used to embellish the flower area. The border is composed of several composite stitch patterns, using different variations and color sequences. The flower and leaves are worked in padded satin stitch. Two types of darning patterns complete the center panel areas. To create the feeling of leaded glass, each area is couched in Japanese silver, using both traditional and non-traditional Japanese couching techniques.